A professional MTS/M2TS Converter, MTS/M2TS file joiner. Convert/merge MTS/M2TS videos. Some days ago, a friend of mine happened to a problem: He had a camera (Panasonic Lumix GF-1) that outputs "AVCHD Lite" files, 720p h264 in a MTS container and he tried to edit AVCHD lite in Movie Maker on his windows 7 but failed, so he wanted me to introduce some free or inexpensive non-linear video editors (NLE) that can natively handle AVCHD Lite files? Or recommend him a 3rd party program that is especially stable to convert AVCHD Lite files to Movie Maker. Maybe some of you have the same problem. In order to solve this issue, we should learn three things: 1. What is AVCHD Lite? 2. Which editing software supports AVCHD Lite files and is not expensive? 3. Any third software can convert AVCHD Lite to Windows Movie Maker on Win 7 without losing quality? 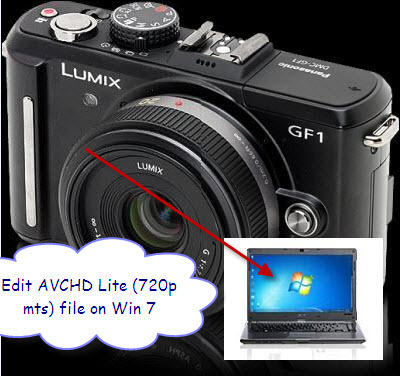 Now I could give the answer and best and inexpensive way to edit “AVCHD Lite" files, 720p h264 MTS on Win 7. 1. What is AVCHD Lite? 2. Which editing software supports AVCHD Lite files and is not expensive? Maybe you will ask: Is there any difference between AVCHD and AVCHD Lite? The editing software that supports AVCHD, does it also support AVCHD Lite? Don’t worry, all you really need to know is that any video editing application with support for AVCHD should also support AVCHD Lite without your needing to do anything differently. (1) Cyberlink PowerDirector 8 ($99.95) is capable of editing AVCHD natively, without transcoding, intermediate codecs or proxy files. Using a patented technique (SVRT), AVCHD clips can be edited and output losslessly to AVCHD. PowerDirector can output the finished movie to a variety of video formats, DVD, AVCHD on DVD, or Blu-ray disc. (2) VideoStudio Pro X3 ($89.99) version supports HD formats including AVCHD and MPEG-2 HD. It would not open individual AVCHD files, but it could import clips from a folder. VideoStudio was a bit sluggish when dealing with AVCHD files. It took seconds to switch between the editing steps. (3) Sony Vegas Studio 9 Platinum ($84.95) supports HD video, including HDV capture and editing. It also supports AVCHD import and edit, but only from Sony camcorders. 3. Any third software can convert AVCHD Lite to Movie Maker on Win 7 without losing quality? The editing software claims it can support and edit AVCHD, but how does it work in practice, I can’t give you a clear and precise answer, for some files can do, some may not. If you don’t want to waste money to purchase the expensive editing software, and still want to use Windows Movie Maker on Windows 7 for editing AVCHD Lite (720p) MTS files, only you need is an inexpensive and powerful AVCHD Lite Converter. From Google search, you may find lots of AVCHD and AVCHD Lite Converter in the market now, but which one works perfectly may be your biggest concern. Here I recommend you this good AVCHD Lite Converter called Aunsoft MTS/M2TS Converter which is designed to convert 1080p, 1080i, 720p AVCHD (*.mts, *.m2ts) file and 720p AVCHD Lite (*.mts) files to any other popular video format at high fast conversion speed and excellent output quality, and without audio/video out of sync. I was very satisfied with the final output. It's a solid piece of software and I would recommend this product to other video editors. Converting was fast enough and of very good quality. Yes I am completely satisfied. I found your product can help me deal with the m2ts files so well. I'm using it for joining and converting sony hdr-3 video. Wish I had this three years ago. Speed is good enough on dual processor laptop. I am very satisfied.